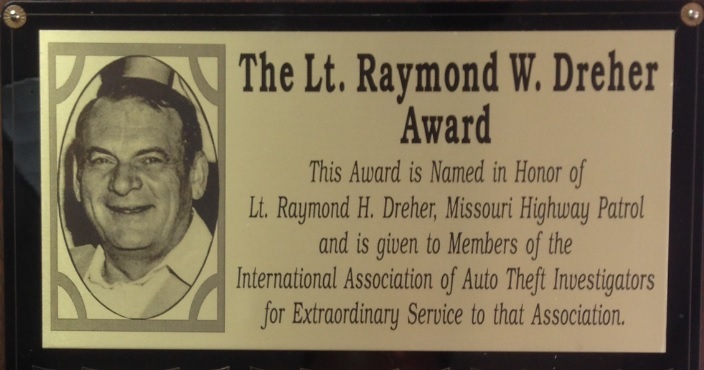 The Raymond W. Dreher Award was created in 1984 as IAATI’s most prestigious award and is presented in memory of the late Lt. Ray Dreher of the Missouri Highway Patrol, and IAATI’s 16th President. While not necessarily a yearly award, this is given as recognition for IAATI’s most active and dedicated members who have distinguished themselves by service to the Association. It is only awarded to those giving of themselves far and above what is expected and required of membership. There are no other requirements for the award, except hard work and dedication to IAATI with an international focus. This year IAATI was proud to announce the Ray Dreher Award winner was Pat Clancy. Pat spent 15 years in law enforcement. He began his career as a military policeman with the US Army’s 515 Military Police Company and a Provost Marshall Investigator. After the military, Pat began working at the Medford, Massachusetts Police Department. While at the Medford PD, Pat received a promotion to Sgt. and was a student at Northwestern University where he earned a Bachelor of Science Degree in Law Enforcement. During his law enforcement career, Pat estimates that he recovered fewer than a dozen stolen vehicles. 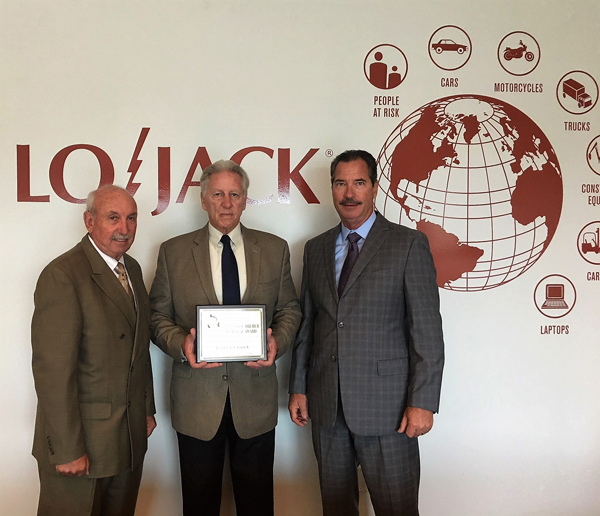 Now, 32 years later, upon his retirement from Lojack this past September, he can stand proud to have assisted law enforcement through the use of LoJack technology with the recovery of over 400,000 stolen motor vehicles worth well over 6 billion dollars resulting in the thousands of arrests. This amazing turn of events started when Pat was with the Medford PD and met up with Bill Reagan, the Police Commissioner at the time. Bill was also an inventor, who had a vision to help law enforcement officers track stolen motor vehicles. He patented his invention and called it LoJack. Bill convinced Pat to take a one year leave of absence from the police department to assist him in developing the LoJack Company. Pat took that year’s leave of absence and never went back. In early 1986 Lojack was granted permission by the FCC to begin a pilot program in Massachusetts. The testing proved successful, and Pat began training approximately 100 law enforcement agencies in Massachusetts for a June kick-off for the sale of LoJack devices to the public. Pat and his boss, Peter Connor (Vice President of government affairs), worked tirelessly to educate and equip those agencies. Pat spoke to thousands of law enforcement officers and troopers throughout the country. And then came the 1986 IAATI Seminar held in Hartford, Connecticut. One of the people that Pat had talked to was Herbie Burr, a past President of the Northeast Chapter of IAATI. Herbie invited Pat to be a vendor at the Seminar and Pat accepted the offer. Pat set up his table outside the main classroom, and during that week he met nearly all of the attendees. Pat took any of the attendees who wished to, on a live tracking demonstration around the State Capital. This writer was actually one of those people who took that eye opening ride. For Pat, the impact of that first IAATI Seminar was huge as he saw an organization that brought together law enforcement, insurance companies, vehicle manufactures, and anyone interested in the ever growing problem of vehicle theft. IAATI has no better friend than Pat Clancy. He has been a steadfast supporter of IAATI and its goals. There were lean years for sure when budgets were restricted, but Pat never wavered in his support and devotion to IAATI. At every seminar since, there have been Lojack law enforcement liaisons (LEL’s) ready to help in any way necessary. We can’t forget to mention LoJack’s presence in our vendor / exhibit hall at nearly every Seminar as far back as anyone can remember. As IAATI grew into a stronger veritable international organization, Pat was there with LoJack supporting us. 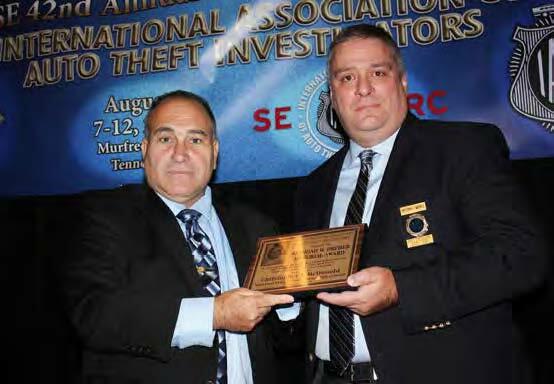 Five of LoJack’s LEL’s have been Past Presidents of IAATI. This past September Pat retired from Lojack after 32 years. His dedication to IAATI and Lojack will be missed by us all. Pat will be spending more quality time with his family and maybe even a little golf! We thank you Pat for being our partner in the battle against vehicle theft, and our friend. Good luck in your retirement. Unfortunately Pat was unable to attend this year’s Seminar in Pittsburgh t accept the award. Past President Tommy Hansen made a formal announcement at the seminar banquet and DJ Thompson accepted on Pat’s behalf. But on August 28, Past President Kevin McHugh and NERC Past President DJ Thompson presented Pat with the award. Kevin McHugh (L) and DJ Thompson (R) presenting Pat Clancy (C) with the Dreher Award on August 28. The Raymond W. Dreher Award was created in 1984 as IAATI’s most prestigious award and is presented in memory of the late Lt. Ray Dreher of the Missouri Highway Patrol and IAATI’s 16th President. While not necessarily a yearly award, this is given as recognition for IAATI’s most active and dedicated members who have distinguished themselves by service to the Association. It is only awarded to those giving of themselves far and above what is expected and required of membership. There are no other requirements for the award, except hard work and dedication to IAATI. At the 2016 Annual Seminar in Murfreesboro, Executive Director John Abounader (last year’s recipient of the award) presented Christopher McDonold, with the award. Chris is currently the Executive Director of the Maryland Vehicle Theft Prevention Council. He was initially appointed Deputy Director as of July 2nd, 2012. After serving 24 years, he retired on June 30th, 2012 from the Baltimore County Police Department in Baltimore, Maryland. Chris joined IAATI in 1995, and served in many positions, ultimately serving as President in 2010 - 2011. Chris is also a past president of the SERC and is currently their Treasurer. He is also a board member of the Maryland/DC Anti-Car Theft Committee and National Salvage Vehicle Reporting Program (NSVRP). The expertise Chris has developed is sought after by many organizations and committees, such as the Vehicle Component Part Label Committee, a federal committee formed to investigate the necessity of vehicle manufacturers including component part labels when manufacturing vehicles. Chris is also the chair of the International Association of Chiefs of Police (IACP) Vehicle Crimes Committee and a member of the National Motor Vehicle Title Information System (NMVTIS) Advisory Board. This board’s purpose is to provide input and recommendations to the Office of Justice Programs regarding the operations and administration of NMVTIS. Chris is the current chair of the NMVTIS Law Enforcement Working Group and is assisting the National White Collar Crime Center (NW3C) with the developing training programs for vehicle theft related programs. Chris was a recipient of the 2012 International Associations of Chiefs of Police Individual Vehicle Theft of Merit Award. As the Editor of Auto Theft Today, he produces and interesting and viable electronic companion to our hard copy APB magazine. He has served in this position for over 2 years. Chris also served as Master of Ceremonies at the recent Asian Auto Theft Summit in Bangkok, Thailand sponsored in by INTERPOL and IAATI. John Abounader has been a member of IAATI since 1992 and since that time served in the NERC becoming a Director in 1994, the Executive Director from 1996 to 2000, and as President in 2006. While John was busy fulfilling his duties in his home chapter, he was also busy with IAATI. John has been IAATI’s Executive Director since 2001. He has either been the chair or a member of just about every committee within IAATI, and he exemplifies the meaning of getting involved. John has led IAATI into many innovative areas during his time as Executive Director. His goal is to project a professional, business-like front office for IAATI. He never fails to meet a deadline date or complete an action to the benefit of the board and IAATI as a whole. In his real life, John is a Senior Investigator with the Dept. of Motor Vehicles, Division of Field Investigations Auto theft Unit for the State of New York. John has worked in the department for 35 years. Prior to that, he was a Deputy Sheriff in the Oneida County (NY) Sheriff’s Department for 1 ½ years, and a patrolman with the Village of New Hartford (NY) Police Department for 3 years. For his outstanding contribution and dedication to IAATI, Past President Robert Hasbrouck (center) receiving the Raymond W. Dreher Award from President Peter Perrien (left) and Past President Tommy Hansen (right). This award was named in honor of Raymond Dreher (President 1971- 1972), a member of the Missouri Highway Patrol. The award began in 1984 and has only been given at 16 of the 28 conferences since the award was established. This year’s committee was comprised of Tommy Hansen (Chair & Past President), Ken MacKenzie (Past President), James Holmes (long-time member and Enews Editor), Charlie Banks (long-time member) and Gene Rutledge (Past President). All committee members were past recipients of the Dreher Award. This year’s winner, Denny Roske, has been one of our most long-time and active members. He has gone far and above what is expected of any member of a volunteer organization. His police career spanned over 30 years with the Minnesota State Patrol and he was involved in auto theft investigation for over 20 years. Most importantly he has been a member of IAATI for four decades. Denny was elected President in 1999. He has served and chaired numerous committees over the years and has always been an outspoken member of the Executive Board. He served on the South Africa oversight committee in the 90’s. He also served on the European and UK oversight committees. He served on the committee that was instrumental in re-instating our South Africa Branch in 2007-08. He assisted with several key ethics investigations throughout the years. He has always brought his outspoken but rational mind to his work in IAATI along with a wealth of knowledge and has always been highly professional in his tasks and responsibilities. He has also chaired the Award of Merit committee for over 7 years and has compiled the Training Section on page 3 of the APB for the last 12 years. 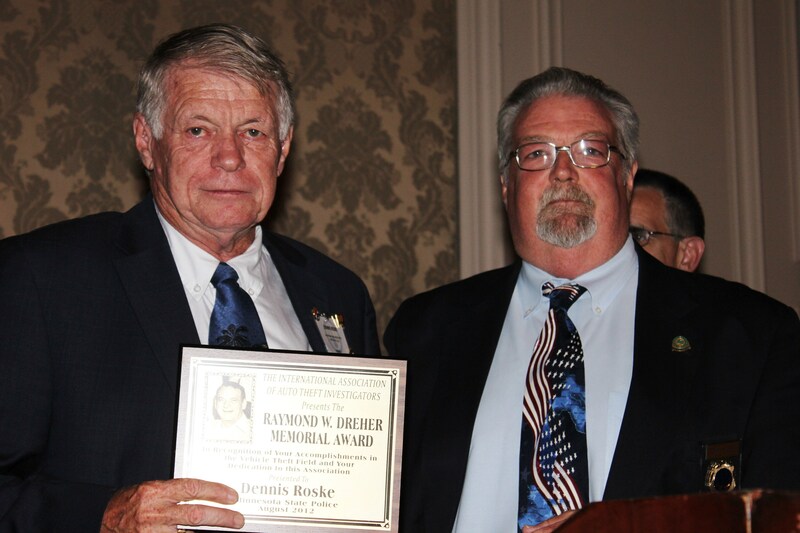 Denny Roske (left) receiving the Raymond Dreher Award from Tommy Hansen (right), Committtee Chair and Past President. Tommy Hansen, Galveston County (TX) Sheriff’s Dept. The Raymond W. Dreher Award, created in 1984, is presented in memory of the late Lt. Ray Dreher of the Missouri Highway Patrol, and IAATI’s 16th President. While not necessarily a yearly award, this is given as recognition for IAATI’s most active and dedicated members who have distinguished themselves by service to the Association. It is only awarded to those giving of themselves far and above what is expected and required of membership. There are no other requirements for the award, except hard work and dedication to IAATI. This year’s recipient is Tommy Hansen, a Lt. with the Galveston Co., Texas Sheriff’s Offi ce. He has been with the sheriff’s offi ce since 1973. Tommy has been a member of IAATI since 1981, and served as our President during the 2006 – 2007 year. He has either been the chair or a member of just about every committee within IAATI, and has exemplifi ed the meaning of “getting involved”. Tommy is also very active in his home state of Texas, where he is heavily involved with the Texas Auto Vehicle Theft Investigators and the Texas Auto Burglary and Theft Prevention Authority. He was instrumental in the formulation of the recently adopted National Motor Vehicle Title Information System, which has become a mainstay for anyone involved in the investigation of vehicle theft or fraud. Tommy has also instructed motor vehicle theft classes in various parts of the country for many years. Tommy is not just involved with vehicle theft causes. He is involved with the Ronald McDonald House of Galveston and the Children’s Advocacy Center in Galveston. But, his real love is “Beat the Heat” an international law enforcement youth education program. With this organization, Tommy drives a race car for the Tropical Impression Racing Team on 1/4 mile drag strips throughout the country. Most recently Tommy has been the chair of the Site Selection Committee for our annual Seminar. He has been a key in formulating and bringing the 2012 Seminar to the Kansas City area. Tommy spent a lot of his own personal time on this Seminar project. His dedication to IAATI, the painstaking efforts he has put forth in all he has attempted, makes him a proud member of this Association and deserving of this award. The Dreher Award Committee thanks Tommy Hansen for his service and dedication, and congratulates him on being the recipient of this award. The Raymond W. Dreher Award is given in recognition of extraordinary services to IAATI and is presented in memory of the late Lt. Ray Dreher of the Missouri Highway Patrol, IAATI’s 16th President. Jim Holmes of the Washington Metropolitan Transit Police joined IAATI in 1979. Over the years, Jim has distinguished himself by his hard work and dedication. 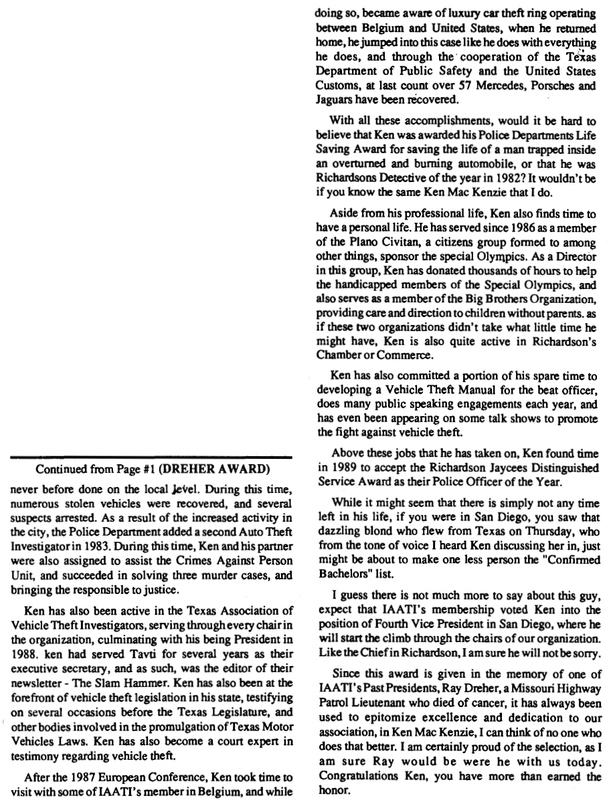 He served on the IAATI Executive Board several times and is Past President of SERC. He has received numerous awards including the IAATI 3M Award, the IAATI Directors’ Award as well as from numerous other organizations. Indeed, at the Orlando seminar, he also won SERC’s Life-Time Achievement Award. Jim is a self-starter and does much work on his own time as his department does not have an auto theft unit. His yearly vacations are planned around at least one vehicle manufacturing plant visit so that he may increase his knowledge and be a better instructor. His expertise includes secondary points of identification on some vehicles, points that are often not available to others. Jim was instrumental in the passage of the Federal Motor Vehicle Theft Act of 1984 which requires manufacturers to place component part labels on major parts. time-consuming and often thankless job. Jim has traveled far and long, again mostly at his own expense and has taught thousands of people involved in vehicle theft investigation. Jim Holmes epitomizes what this award stands for. Jim, the Dreher Award Committee extends its thanks and appreciation for your dedication. Philip J. Crepeau, NYPD (Ret’d), CARCO Group, LOJACK Corp.